Cosplay, or costume play, is the art and science of dressing up to portray a character. Attendees dress up as a variety of characters, from their favorite TV series, comic books, and video games. And many more events. Please check the Event Finder for a complete list of cosplay programming at Gen Con this year. Mogchelle has won countless awards for both craftsmanship and performance, starting as a novice, and working her way up to the master level of competition as of 2003. In 2012, she reached international award status by competing at the World Science Fiction Convention, where 2 awards were won, Best Re-creation, and a special Golden Quill award for a custom set of angel wings. Mogchelle will be coordinating the cosplay program, as well as participating in many cosplay workshops and seminars. Follow her on Facebook @mogchellecosplay. Brit Bliss is a cosplayer, avid gamer, and model from Columbus, OH. Maxim Magazine launched her career when they published her in their both their print and online magazines. She has also been seen in PASMag, FIGHT!, RacerX, and many others. After wanting to indulge her nerdy interests more, she began to use her sewing skills to bring her favorite video game characters and super heroes to life. Brit started to make her own costumes to attend comic conventions and fell in love with it, even drafting a lot of the patterns she used to create something truly unique for herself. Each new character presents a unique challenge in order to keep testing and improving her abilities. What was once a hobby has now become a lifestyle for her. 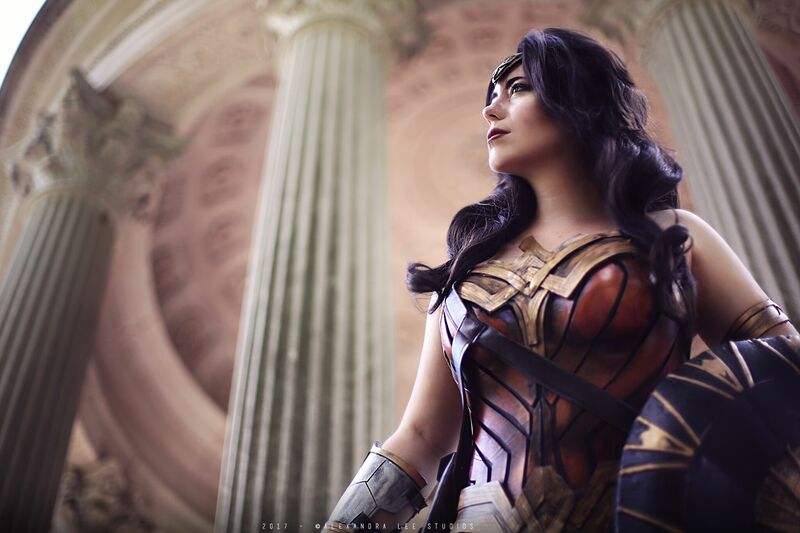 In the past three years of cosplaying professionally, her fan favorite cosplays include a pin-up Captain America, Catwoman, and Squirrel Girl. Since starting, she has grown a fanbase of over one million people on Facebook alone. Follow Britt on her Facebook page @TheBrittBliss. Our Cosplay Guest of Honor for Gen Con 2018 is Jedimanda! Jedimanda has been featured on several sites such as StarWars.com, D23 (Disney fan club), Kotaku, Nerdist, and SyFy. She has competed in, and won, costuming contests across the country. For more information on Jedimana, check out the Cosplay Guest of Honor page. We have dedicated areas located throughout Lucas Oil Stadium and the Indiana Convention Center for you to stop and take your picture. Stop by and take a photo of your costume to post online and share it with friends! Gen Con has a dedicated Instagram account to showcase all of the amazing costumes at the convention. Tag the account #GenConCosplay in your photos and we might repost them! Come dressed as your favorite character, creature or creation Thursday, Friday, or Saturday to join this contest! Our Gen Con Cosplay Team will be roaming the hallways handing out awards for the best costumes and will be awarding those taking pics! Bring your creativity and wear your finery because you never know who might be watching! Cosplay is a culture that celebrates inclusion and mutual respect. Thus, please be cautious when interacting with each other and keep your hands to yourself. If you would like to take a photo of or with another Gen Con attendee, please ask before doing and respect that person’s right to say no. In short: be kind, be respectful, and make the cosplay experience fun for everyone involved! Gen Con's 4th Annual Crossplay Contest! Come watch or compete! All are welcome to this incredibly fun event full of creativity & inclusivity! Bring your best crossplays and/or genderbends! Prizes!